Pacific Island Countries: Did you PLAY today? 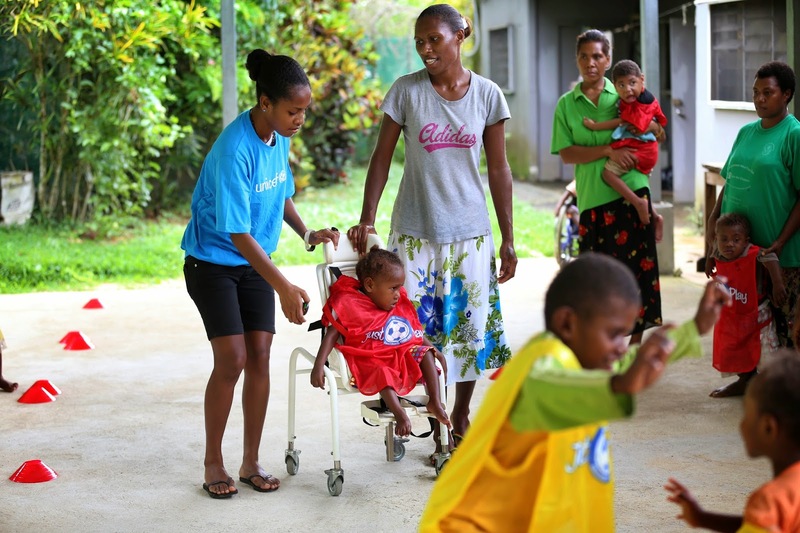 Persons with Disabilities in Port Vila, Vanuatu. Everyday around the Pacific region, children gather in open spaces, at community schools and on empty pitches to take part in Just Play sessions. Equipment bags come out, cones and balls line the field. Children gather around their coach and wait in anticipation as the Challenge of the Week from the last session is reviewed. Hands fly into the air in response to their coach’s question: “Who worked hard to make health lifestyle choices, eating 2 fruits and 3 vegetables today?” Smiles can be seen, and applause heard coming from the group acknowledging their accomplishment. Seconds later, the pitch is flooded with children as the session kicks off. “We must all work together” explains the coach. “Both on and off the field. Remember, we are a team”. In the Pacific, healthy eating deserves recognition and praise. Prevalence of obesity and diabetes have spread from mainly adult problems to more and more children. 48 percent of children aged 13-15 years classified as overweight or obese. Teaching children how to make healthy food choices and helping them to enjoy playing sports is critical. In the Pacific only 29 percent of children attended regular physical activity classes and only 32 percent of children play for 60 minutes or more a day. Wan Smal Bag in Port Vila, Vanuatu. Using sports to teach about healthy lifestyles to children is one of the key elements of Just Play. Through the integration of social messages, the programme is helping children to develop healthy behaviours, encourage gender equality, promote social inclusion, and become self-confident young leaders in their community. After explaining the game, the coach listens as the children suggest how they can work together during the game and at school the next day. The whistle goes and the coach steps back, giving the children the opportunity to put what they discussed into practice. With a ball, a coach and a safe place to play, children in 11-Pacific Island countries learn how to have fun with other children, be physically active and become confident in their abilities through Just Play programmes everyday. Article 31 of the CRC clearly articulates that all children have the right to play. This year UNICEF celebrates the 25th year the Convention on the Rights of a Child (CRC) came into effect. The Just Play Programme has been designed and developed by the Oceania Football Confederation Social Responsibility department, in partnership with the Australian Government through the Australian Sports Commission, Football Federation Australia, UEFA and UNICEF Pacific. For more information on how UNICEF Pacific is helping Just Play to put children first please visit: www.unicefpacific.org or http://justplayofc.org/.